The MULTICOIL heater tubular element with multiple coils and/or thermocouples inside one sheath answers the need for a versatile, innovative tubular multiple coil heater. Watlow's patented method of packaging a thermocouple inside of a heater with one or more resistance coils, gives the ability to sense a heater's internal temperature accurately, every time. 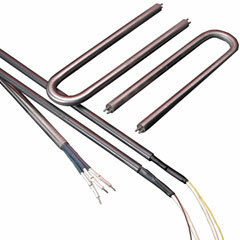 Moreover, this is the first tubular heater in the industry with three-phase capability. The three coil, three-phase heater will offer a compact package solution while delivering the full power required in a compact heater package. Previously three separate heaters would have been required to do the same job; therefore Watlow's MULTICOIL™ heater capabilities save money.